William Howard Schuman was born in New York City on August 4, 1910, the second child of Samuel and Rachel Schuman. He began to study the violin as a young boy and later played a number of other instruments as well. His broad musical interests ranged form his own jazz band and the school orchestra to family evenings singing operetta and musical comedy excerpts as well as “semiclassics.” On his own, he wrote some original popular songs. But music definitely took second place to Schuman’s all-consuming passion, baseball. Looking back on his youth, he would later claim that baseball was the main focus of his early years. In 1928, Schuman entered New York University to prepare for a business degree at the School of Commerce, while at the same time working for an advertising agency. He continued to collaborate on pop songs with E.B. Marks, Jr., an old friend from summer camp, and also created some forty songs with lyricist Frank Loesser, a neighbor who was also at the beginning of his career. Loesser’s first publication, in fact, was a song with music by Schuman. Together they wrote many songs for radio, vaudeville, and nightclub acts. In April 1930, having attended (albeit unwillingly) his first professional symphony orchestra concert, Schuman suddenly realized that baseball, business, and popular music must be relegated to subsidiary positions (but never forgotten) in favor of composing “classical” or concert music. Realizing that extensive training would be necessary to reach his goals, Schuman withdrew from New York University to study harmony with Max Persin and to hear as many concerts and operas as he could. He began counterpoint lessons with Charles Haubiel and at The Juilliard School attended summer courses in orchestration with Adolf Schmid and harmony with Bernard Wagenaar. Two years at Teachers College of Columbia University not only earned Schuman a B.S. in music education (1935), but also set him thinking about the current state of music education and how strongly he felt the need to reform and improve it. In 1944, G. Schirmer, Inc. appointed Schuman Director of Publications. He began work there even before leaving the Sarah Lawrence faculty and continued to serve Schirmer as Special Publications Consultant after moving in 1945 to his next post, the presidency of The Juilliard School. During the 1940s Schuman received his first honorary doctorates, became the father of a son and daughter, and was awarded the first Pulitzer Prize ever given in the field of musical composition. In spite of the heavy demands of his Juilliard presidency : into which he threw himself wholeheartedly, making essential and lasting improvements in the school : he remained first and foremost a composer. Schuman is a rarity among composers in that he was always able to balance his creative endeavors with administrative duties, classroom teaching, writing, public service, consultancy work, and public speaking. Schuman was clearly fond of public speaking, an activity at which he had always triumphed. In 1961, Harold C. Schonberg wrote of him in The New York Times Magazine “the man can speak with the fervor, hypnotism and eloquence of Gielgud on one of his better days.” Schonberg further stated, in the words of an awed observer, “he is by far the most brilliant off-the-cuff speaker in America.” In one BMI brochure, Oliver Daniel claimed that Schuman “possesses in abundance the intellectual agility and personality quotient that stamp a man ‘presidential caliber.’” Indeed, Schuman was a man of multiple talents and boundless energy who accomplished in his long career what might have been achieved in the lifetimes of four or five ordinary mortals. As Juilliard president, Schuman convinced the planners of Lincoln Center that the School should become one of its constituent organizations. It was not long before the Lincoln Center board of directors named him to preside over the entire complex. Schuman’s tenure as president of Lincoln Center began in January, 1962, months before the official opening of Philharmonic Hall [as Avery Fisher Hall was then known], the first completed building. He guided the growth of Lincoln Center, establishing both the Chamber Music Society of Lincoln Center and the Film Society of Lincoln Center. During this time, he continued to add to his own catalogue of compositions. In 1968, Schuman suffered a heart attack, and while recuperating, took stock of his personal and professional priorities. His ultimate decision was that he should forgo major administrative posts, and therefore would resign from Lincoln Center. Effective January 1, 1969, he was named President Emeritus, as he had earlier been designated by the Juilliard School. This change was far from a retirement, but not having a full-time position allowed Schuman more freedom to compose and still participate in the dozens of organizations he served as consultant, officer, board member or advisor. Schuman was never one just to donate his name to a cause or a letterhead, but always believed in working for any foundation, school corporation, or agency with which he was connected. For four decades he provided invaluable direction to the BMI Student Composer Awards. First as a founder, then as chairman of the judging panel, and finally as chairman emeritus, Schuman was a guiding light and an inspiration for over 350 student composer award winners; his interest in their training, accomplishments, and styles of composition never waned. In Schuman’s pieces you have the feeling that only an American could have written them. You hear it in his orchestration, which is full of snap and brilliance. You hear it in the kind of American optimism which is at the basis of his music. Schuman’s impressive catalogue of works is especially rich in orchestral, band, and choral music. He continued the strong American symphonic tradition of such predecessors as Roy Harris and Walter Piston and is particularly recognized for his mastery of orchestration. On of : if not the : most popular of Schuman’s works is his orchestration of Charles Ives’ Variations on “America.” Created in response to a twentieth-anniversary commission from BMI and first performed in 1964, this brilliant orchestration enjoyed extraordinary popularity during the U.S. Bicentennial year. Along with New England Triptych and American Festival Overture, it remains one of his most frequently performed works. In his orchestral compositions Schuman was fond of differentiating the various sections of the orchestra by creating distinct blocks of color; he used a large orchestra, but used it wisely and with great clarity. He drew on a variety of compositional devices, from fugues, canons, and passacaglias, to toccata, chorale, or variation procedures. He always had a clear plan for the ultimate large-dimension structure of a work. His basic building block may have been a small unit : as the three-note melodic germ in American Festival Overture : but he planned on a large scale, setting up tension and building suspense to a dramatic climax. Traditional tonality was not a framework which Schuman was bound by, and he did not write his scores with key signatures. He did not restrict his harmonic vocabulary, but used an ample palette of chromaticism and the entire range of scales and modes in Western music. He could create powerful and thick harmonic structures; while these may sometimes sound polytonal, a tonal resolution usually follows. Long spun-out melodies and majestic arcs of sound characterize many of Schuman’s orchestral works. His rhythmic style is vital, full of variety, and intense : but never nervously so. Whether in simple ostinati, in complex rhythmic counterpoint, or in his characteristic cross rhythms, Schuman reveals his strong rhythmic foundations, undoubtedly gained in part from his early days with jazz and popular music. In Schuman’s works based on pre-existing music, he absorbed elements of the source into his own style, while still maintaining the integrity of the original. 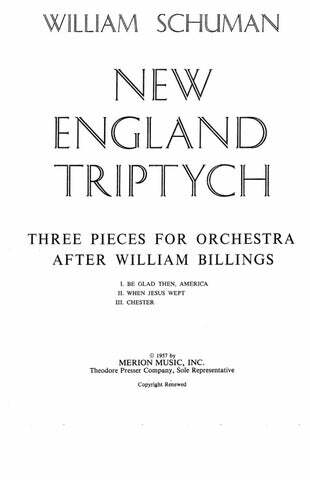 In New England Triptych and the Concerto on Old English Rounds, his approach ranges from almost literal quotation to a wide range of juxtapositions, and transformations with extensive melodic, rhythmic, and harmonic alterations, as well as wholly new concepts of form and orchestration. The great variety and skill with which he handled his materials are demonstrated particularly well in the group of three works based on the old English round “Amaryllis”: the “Amaryllis” Variations for string trio, Concerto on Old English Rounds (using “Amaryllis” as the basis for the first and final movements), and Amaryllis (Variants on an Old English Round), a brief version for string orchestra. Along with Schuman’s re-use of pre-existing music should be mentioned his reworking of several of his compositions. Among the most performed important works available in more than one version are the Variations on “America” American Hymn, and New England Triptych. Others include The Mighty Casey (opera), Casey at the Bat (cantata), and the separately published Choruses from the Mighty Casey; The Orchestra Song and The Band Song; choral and solo versions of Holiday Song; and In Sweet Music and A Song of Orpheus, both derived from his early song Orpheus with His Lute. In the world of choral music, Schuman is known as a master of both a cappella and accompanied styles, of both extended cantatas and short pieces, including some written for amateurs. With a special emphasis on American poetry, he was particularly discriminating in his choice of texts. The poetry of Walt Whitman, Archibald MacLeish, Genevieve Taggard, Langston Hughes, Edna St. Vincent Millay, and Thomas Wolfe, among others, inspired him. It is difficult to imagine anything more American than Casey at the Bat, or the Mail Order Madrigals, which are settings of texts from the Sears Roebuck catalog. After writing many pop songs in his youth (estimated to be a hundred or more, but, alas, not a hit among them), Schuman evinced a marked preference for orchestral and choral music during most of his career. In the late 1970s, he began adding more music with voice to his catalog, including In Sweet Music, The Young Dead Soldiers, and Time to the Old. Even more significantly, his two major works of the 1980s featured solo voice(s): On Freedom’s Ground and A Question of Taste. I have rarely met a composer who is so faithfully mirrored in his music; the man is the music. We are all familiar with the attributes generally ascribed to his compositions: vitality, optimism, enthusiasm, long lyrical line, rhythmic impetuosity, bristling counterpoint, brilliant textures, dynamic tension. But what is not so often remarked is what I treasure most: the human qualities that flow directly from the man into the works : compassion, fidelity, insight, and total honesty. Opera in One Act, after a story by Roald Dahl 50:00 2(Picc.) 2 2 2 – 2 2 2 0; 2Perc. Cel. Str. 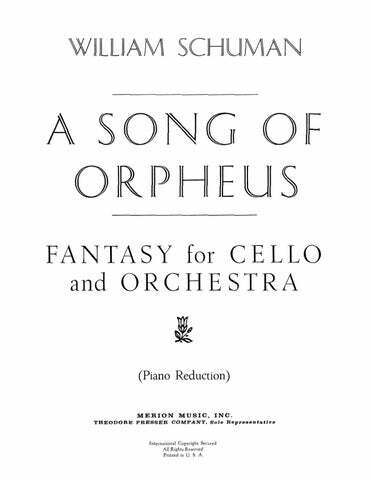 Fantasy for Cello and Orchestra or Chamber Orchestra 20:00 Orch. : Solo Vcl. ; 3 3 2 2 – 4 0 0 0; Hp. Str. Chamber Orch. Version: Solo Vcl. ; 2 2 3 2 – 1 0 0 0; Hp. Str. Variants on an Old English Round for String Orchestra 10:00 Str. 27:00 3 3 3 3 – 4 3 3 1; Timp. Perc. Cel. Str. 26:00 Solo Vln. ; 3 3 4 3 – 4 3 3 0; Timp. Perc. Str. for Viola, Women’s Chorus and Orchestra 40:00 Solo Vla., SSAA Choir; 3 3 3 3 – 4 3 3 1; Chimes, Str. 18:00 4 4 5 4 – 6 4 3 2; Timp. Perc. Pno. Str. Canticle for Orchestra 17:30 3 3 3 3 – 4 3 3 1; Timp. Perc. Pno. Str. 13:00 3 3 4 2 – 4 3 3 1; Timp. Perc. Str. 1:30 4 4 5 3 – 6 4(in C) 3 2; Timp. Perc. Pno. Str. 4:00 3 3(E.H.) 3(B.Cl.) 3(Cbsn.) – 4 3 3 1; Timp. 4Perc. Pno. Str. 26:00 4 4 5 4 – 6 4 3 2; Timp. Perc. Pno. Cel. Hp. Str. 30:00 Full Orchestra: 4 4 4 4 – 6 4(in C) 4 1; Timp. Perc. Pno. 2Hp. Str. Reduced Orchestra: 3 3 3 3 – 6 4(in C) 4 1; Timp. Perc. Pno. 2Hp. Str. 22:30 3 4 4 4 – 4 4 3 1; Timp. 4Perc. Pno. Str. 30:00 4 4 4 4 – 6 4 4 1; Timp. 6Perc. Pno. Cel. Hp. Str. Ballet 30:00 1 1 1 1 – 1 1 1 1; Timp. Perc. Pno. Str. for Horn and Orchestra 24:00 Solo Hn. ; 3 2 3 2 – 0 3 0 0; Timp. 4Perc. Pno.(Cel.) Hp. Str. 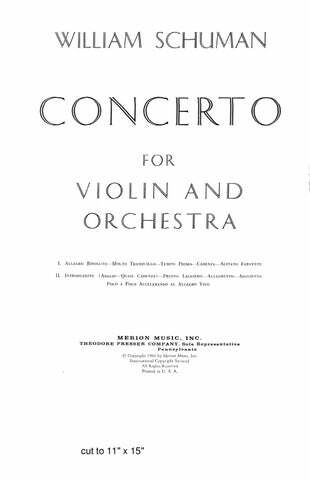 (Orchestra Version by William Schuman)(arr.) 8:00 3 2 2 2 – 4 3 3 1; Timp. 3Perc. Str. (based on an organ composition by Charles Ives) 8:00 3 2 2 2 – 4 3 3 1; Timp. 3Perc. Str. for Orchestra 25:00 3 3 3 3 – 4 3 3 1; Timp. Perc. Pno. Str. Lamentation for Soprano, Horn, 8 Woodwinds and 9 Strings 15:00 Solo Sop. ; 2Ob. E.H. 2Cl. B.Cl. 2Bsn. 4Vla. 4Vcl. Cb. for Baritone, Mixed Chorus and Orchestra 40:00 3(3Picc.) 3(E.H.) 3(B.Cl.) 2 – 4 3 3 1; Timp. 4Perc. Pno.(Cel.) Str. These pieces [Symphonies Nos. 4 and 9] are layered with dark mysteries that make you want to hear them again and again. 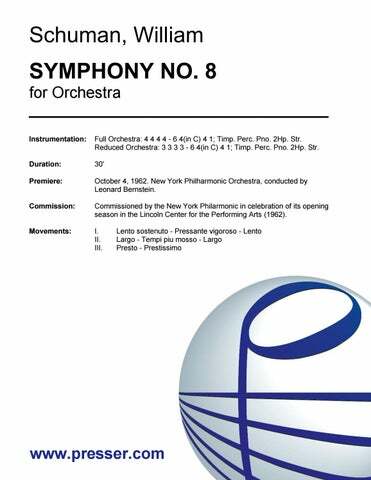 …an impressive work and beautifully orchestrated; [the soloist’s] lyrical line was never overpowered. the searing, devastating account of William Schuman’s Symphony No. 9 (“Le fosse Ardeatine”) … made the evening memorable. […] bleak, somber landscape and uncompromising intensity [and] musical vision.